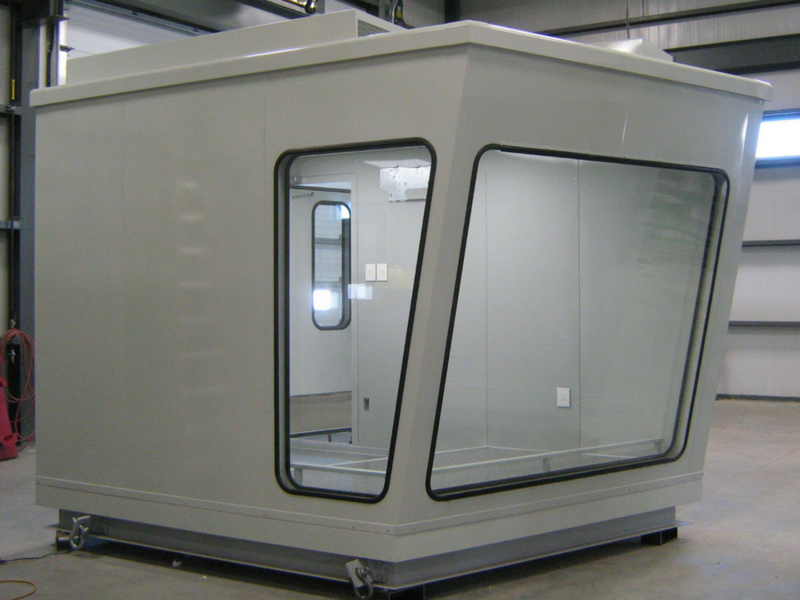 When clients come to us looking for soundproof control rooms, operator cabins and acoustic enclosures, we ask about the sound attenuation they need for their project (STC-35, STC-45 or STC-52+). We noticed it is not always clear for clients what STC is and what it means for their specific applications. Here is an article to explain to you the basic of acoustics, help you understand our standards and the industry’s reference standards. This article covers airborne noise. Sound transmission can be both airborne and/or structure-borne vibrations. Structure-borne vibration is assessed by a different standard: Impact Insulation Class (IIC); but is not addressed in this article. 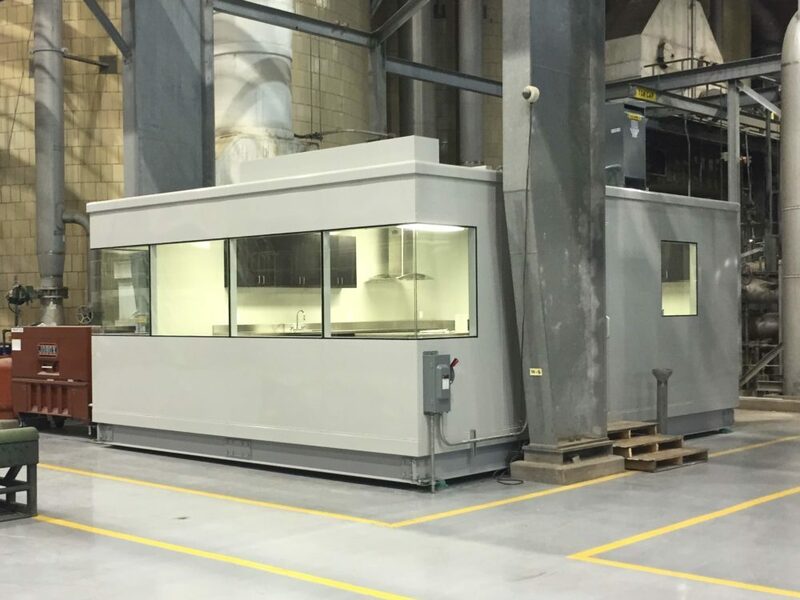 With Mecart buildings, structure-borne noise is reduced by adding a vibration damping system to the structure. STC stands for Sound Transmission Class. It is the ability of a product or material to reduce the transmission of sound between rooms. It measures how much sound a wall, door, window or ventilation system, for instance, will block noise from getting through to the other side. STC is a widely used rating of sound attenuation performance of wall and floor systems. Laboratory tests are conducted per ASTM E90 and classified per ASTM E413. By taking the laboratory-tested transmission loss values of the partition material at 16 of the most common frequencies (between 125 Hz and 4000 Hz), a curve is created. Results are compared to a standard STC reference curve. From this calculation, an STC value is determined. The higher the STC rating, the more effective that material is at reducing sound transmission of the most common frequencies. Frequency is the number of waveforms per second and is measured in Hertz (Hz). In general, low frequencies (like a drum sound) are harder to block than high frequency (like a whistle). The loudness of sound is expressed in decibels (dB). Transmission loss is the measurement of the volume (dB) difference on either side of a wall. One caveat: Soundproofing solutions that are rated STC alone do not convey their ability to mitigate sound at various frequencies. A soundproofing system with a high STC rating may be effective at blocking high-frequency noise, but not low-frequency noise, and vice versa, as illustrated on the transmission loss graph. For example, if you look at the transmission loss result graph, you can see that at a frequency of 125 HZ, the number of decibels blocked is only about 12 decibels for the STC-29 gypsum board and 18 decibels for the STC-26 steel sheet (26 GA). However, at high frequencies above 2000 HZ, the steel sheet performs better than the gypsum and blocks over 30 decibels. In addition, frequencies outside or close to the lowest and highest part of the spectrum are not well-represented. As mentioned before, STC ratings only cover 125 Hz to 4000 Hz frequencies. Yet, many noises are below 125 Hz. For example, power transformers’ noise levels hover on the 125 Hz to 250 Hz octave band. These low-frequency noises are harder to stop. Aircraft engines, heavy equipment, machinery, industrial processes and tapping machines are other low-frequency noise sources. For these sources, accurate assessment of sound transmission requires a detailed analysis in frequency bands. Mecart’s standard acoustic products are labelled STC-35, STC-45 and STC-52. As previously explained, this means they have been tested in a laboratory for their sound transmission loss. When we say STC-35, it means the enclosure, wall partition or door reduce noise by 35 decibels. The same logic applies to solutions rated as STC-45 and STC-52. The test results are available upon request. A sound reduction of 35 decibels is very high. 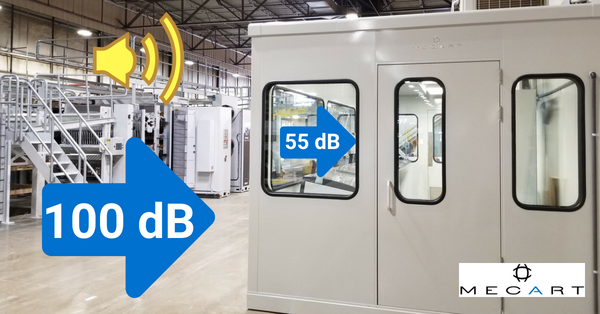 Most similar soundproof enclosures on the market reduce noise by only 15 to 25 decibels. However, Mecart’s lowest sound attenuation products are 35 decibels and are used in the noisiest environments. Why aren’t products as soundproof as labelled once installed? For most material available on the market, the noise reduction once installed is less than that achieved by the material during product testing. The problem isn’t with the product itself, it’s with everything around it. Airborne sound travels through the air and can also pass under doorways, under or around a wall, through ventilation, through common ductwork, plumbing or corridors, and over, under, around, and through any obstructions. Therefore, even with a high STC rating, any penetration, air-gap, or “flanking” path seriously degrades the isolation quality of a wall. For example, even if you buy a STC-45 acoustic door, if noise passes through the walls, floor and ceiling, the actual sound reduction will be far less than 45 decibels. However, this is not the case with Mecart enclosures. Mecart doesn’t only test the acoustic components (walls, doors, etc.) 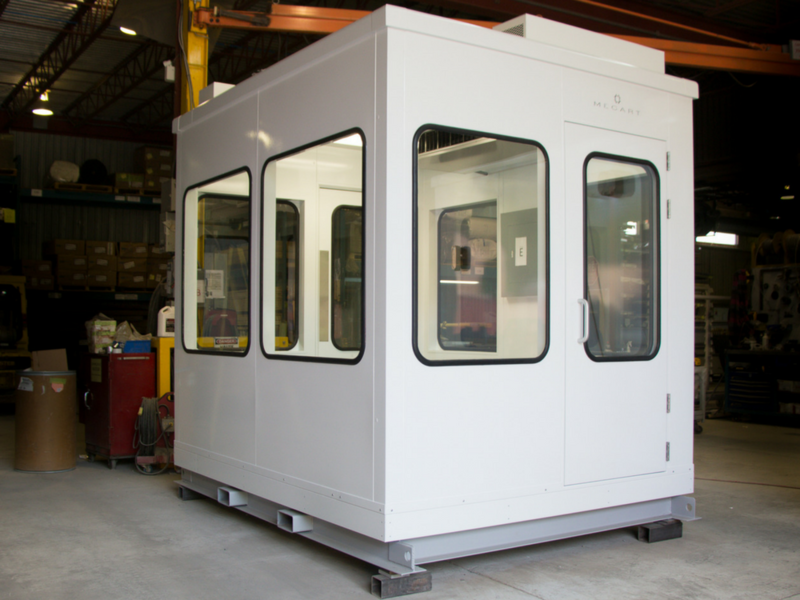 individually but also complete assemblies to ensure that they are as acoustically effective—both alone or assembled. We also guarantee the acoustic performance of our products; therefore, if they are rated STC-45, they will achieve a reduction of 45 decibels. See a demonstration of an acoustic test here. NRC is a rating used to measure sound absorption. Like a sponge absorbs water, an acoustic product absorbs sound. It is used to improve the acoustics within a room or the sound in a studio. The NRC rating is between 0 and 1; 0 means that the solution absorbs no sound, while 1 means that it absorbs all the sound. In an anechoic room, also called a quiet room, the NRC is at the highest level; this is why when you shout, you can’t hear yourself. In other words, NRC measures how well a product reduces sound bouncing around or echoing within a room, whereas STC represents how well a material will block sound from entering or leaving the room. NRC is not often discussed in our industrial noise control projects, where soundproofing rather than sound absorption is needed. Want to protect your operators from noise?